N Regular cast The shrinkage cavityis locatedin the middle ofthe side opposite to the workingface near to the surface. EL End cast The castingis made from the end of the block opposite to the metalline andthe major shrinkage cavityis cut off. KLB Void free The part of the block containing the shrinkage cavityis cut off. KLP Void free The part of the block containing the shrinkage cavityis cut off. KLS Void free The part of the block containing the shrinkage cavityis cut off. When developing the production technology of fused cast refractories, MOTIM has always taken great care to eliminate or control the dispersion of shrinkage cavities during solidification of the fused material, as this has a great influence on the behaviour and resistance of the blocks against wear in operation. MOTIM manufactures KORVISIT and ZIRKOSIT blocks by different casting methods. 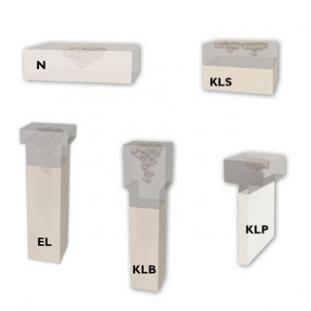 These categories offer regular cast, reduced cavity and void free solutions.The shrinkage cavity location and solidity of the blocks are monitored by a non-destructive test method. Low-grade radiation of an isotope passes through the blocks and the intensity of the radiation beam is measured at grid points on the blocks. The intensity values received by the detector are compared to the point of reference by a computer program to derive the solidity of the block. The solidity of the throat blocks, void free and end cast side wall blocks are monitored by this method. The measured values are registered and together with the visible illustration of the cavity location documented according to the quality system.